Continuing his tirade against Prime Minister Narendra Modi over his "absence" in the ongoing winter session of Parliament, Rahul Gandhi on Friday asked what was he scared of, while daring him to participate in the debate on demonetisation to clarify everything. 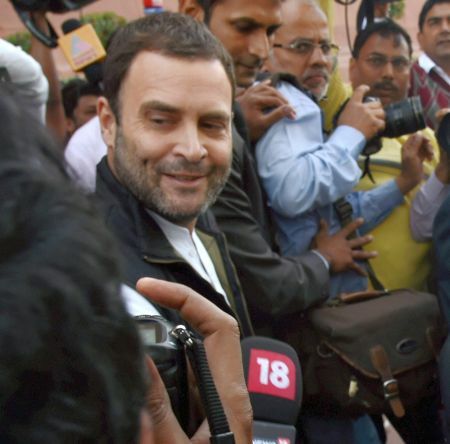 Speaking to reporters at the Parliament premises, Congress vice president Gandhi said the prime minister had "laughed" at the misery of people post demonetisation (during his visit to Japan earlier this month) and become emotional while speaking on the issue. "Let's see what emotions appear on his face when he comes to the Lok Sabha," Gandhi said as he dared the prime minister to take part in the debate. "The main issue is that the prime minister doesn't come to the Lok Sabha for discussion. The moment he comes to Lok Sabha, doodh ka doodh, paani ka paani ho jayega (everything will be clear). "The PM doesn't want to sit in Lok Sabha. We have been stopped from speaking in the Lok Sabha. What you are you scared of ?" Gandhi asked. Taking a dig at the prime minister over him addressing the Global Citizen Fest nearly a week ago, Gandhi said that the prime minister can address "pop concerts" but doesn't attend discussion on demonetisation in House. Gandhi further stressed the moment discussion takes place in the Lok Sabha in the presence of Modi, it will become clear who the PM had allegedly told about in advance about the November 8 move. Gandhi suggested the BJP leaders were aware of the move. "He (Modi) is speaking outside, in pop concert, but not in the Lok Sabha," Gandhi said. "Modi ji was laughing (while addressing an event in Japan), then he cried. Come to House, then you will know what emotion his emotion will be in the House," he said. Meanwhile, senior Congress leader Anand Sharma reiterated the opposition's demand for Modi's presence in the House during the demonetisation debate, saying that accountability has to be fixed for the chaos and the financial anarchy caused due to the move. "The prime minister has to come (to the House). He has to explain. Accoutability has to be fixed...for the chaos and the financial anarchy. The prime minister is also answerable and so is the RBI governor," Sharma said. Stressing that the demonetisation move is an "undeclared financial emergency", he said the government needs to explain under which law it has put a curb on the withdrawal of "people's own hard earned money". "Who authorises them...under which provision of the law they have (imposed withdrawal limit)...what is happening in the country is that people have been denied access to their own hard-earned money. No country in the world will allow such a situation to arise which has happened in our country." Reiterating the Joint Parliamentary Committee's demand on the issue, he described demonetisation as a "big scam" and suggested that there was a big surge in bank deposits in September as the information about the move was "selectively leaked."